Shipping now, for 12 month. Mrs. Miller's Apprentice by Pam Buda. 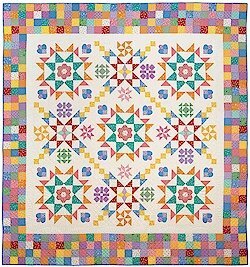 This beautiful Quilt is 77" x 89". You will journey to the mid-19th century and read Mrs. Millers diary, as she tells the story of meeting you Ellie who just moved int the neighboring farm with her widower father. 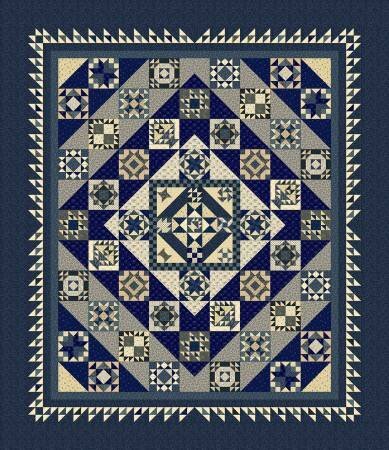 Indigo blue and light quilts were so very popular then and are still classics today. This program begins March 2019. The project can be shipped or you can join in the classes that are held monthly. The is a 15% discount if you order and pay for whole kit. Call 231-271-0117 for more details. Featuring 1930 fabrics and design by "Sew Emma". This quilt can be made in either Queen or King Size and uses approximately 21 yards of material. We still have 2 full kits in stock, please contact us if you are interested 231-271-0117.